Bronchitis is an inflammation of the air passages between the nose and the lungs, including the windpipe or trachea and the larger air tubes of the lung that bring air in from the trachea (bronchi). Bronchitis can either be of brief duration (acute) or have a long course (chronic). Acute bronchitis is usually caused by a viral infection, but can also be caused by a bacterial infection and can heal without complications. Chronic bronchitis is a sign of serious lung disease that may be slowed but cannot be cured. Although acute and chronic bronchitis are both inflammations of the air passages, their causes and treatments are different. Acute bronchitis is most prevalent in winter. It usually follows a viral infection, such as a cold or the flu, and can be accompanied by a secondary bacterial infection. Acute bronchitis resolves within two weeks, although the cough may persist longer. Acute bronchitis, like any upper airway inflammatory process, can increase a person's likelihood of developing pneumonia. Anyone can get acute bronchitis, but infants, young children, and the elderly are more likely to get the disease because people in these age groups generally have weaker immune systems. Smokers and people with heart or other lung diseases are also at higher risk of developing acute bronchitis. Individuals exposed to chemical fumes or high levels of air pollution also have a greater chance of developing acute bronchitis. Chronic bronchitis is a major cause of disability and death in the United States. The American Lung Association estimates that about 14 million Americans suffer from the disease. Like acute bronchitis, chronic bronchitis is an inflammation of airways accompanied by coughing and spitting up of phlegm. In chronic bronchitis, these symptoms are present for at least three months in each of two consecutive years. Chronic bronchitis is caused by inhaling bronchial irritants, especially cigarette smoke. Until recently, more men than women developed chronic bronchitis, but as the number of women who smoke has increased, so has their rate of chronic bronchitis. Because this disease progresses slowly, middle-aged and older people are more likely to be diagnosed with chronic bronchitis. Acute — Disease or condition characterized by the rapid onset of severe symptoms. Bronchi — The larger air tubes of the lung that bring air in from the trachea. Chronic obstructive pulmonary disease (COPD) — A term used to describe chronic lung diseases, like chronic bronchitis, emphysema, and asthma. Emphysema — One of the several diseases called chronic obstructive pulmonary diseases, emphysema involves the destruction of air sac walls to form abnormally large air sacs that have reduced gas exchange ability and that tend to retain air within the lungs. Symptoms include labored breathing, the inability to forcefully blow air out of the lungs, and an increased susceptibility to respiratory tract infections. Chronic bronchitis is one of a group of diseases that fall under the name chronic obstructive pulmonary disease (COPD). Other diseases in this category include emphysema and chronic asthmatic bronchitis. Chronic bronchitis may progress to emphysema, or both diseases may be present together. Acute bronchitis usually begins with the symptoms of a cold, such as a runny nose, sneezing, and dry cough. However, the cough soon becomes deep and painful. Coughing brings up a greenish yellow phlegm or sputum. These symptoms may be accompanied by a fever of up to 102°F (38.8°C). Wheezing after coughing is common. In uncomplicated acute bronchitis, the fever and most other symptoms, except the cough, disappear after three to five days. Coughing may continue for several weeks. Acute bronchitis is often complicated by a bacterial infection, in which case the fever and a general feeling of illness persist. To be cured, the bacterial infection should be treated with antibiotics. Chronic bronchitis is caused by inhaling respiratory tract irritants. The most common irritant is cigarette smoke. The American Lung Association estimates that 80-90% of COPD cases are caused by smoking. Other irritants include chemical fumes, air pollution, and environmental irritants, such as mold or dust. Chronic bronchitis develops slowly over time. The cells that line the respiratory system contain fine, hair-like outgrowths from the cell called cilia. Normally, the cilia of many cells beat rhythmically to move mucus along the airways. When smoke or other irritants are inhaled, the cilia become paralyzed or snap off. When this occurs, the cilia are no longer able to move mucus, and the airways become inflamed, narrowed, and clogged. This leads to difficulty breathing and can progress to the life-threatening disease emphysema. A mild cough, sometimes called smokers' cough, is usually the first visible sign of chronic bronchitis. Coughing brings up phlegm, although the amount varies considerably from person to person. Wheezing and shortness of breath may accompany the cough. Diagnostic tests show a decrease in lung function. As the disease advances, breathing becomes difficult and activity decreases. The body does not get enough oxygen, leading to changes in the composition of the blood. Initial diagnosis of bronchitis is based on observing the patient's symptoms and health history. The physician will listen to the patient's chest with a stethoscope for specific sounds that indicate lung inflammation, such as moist rales and crackling, and wheezing, that indicates airway narrowing. Moist rales is a bubbling sound heard with a stethoscope that is caused by fluid secretion in the bronchial tubes. A sputum culture may be performed, particularly if the sputum is green or has blood in it, to determine whether a bacterial infection is present and to identify the disease-causing organism so that an appropriate antibiotic can be selected. Normally, the patient will be asked to cough deeply, then spit the material that comes up from the lungs (sputum) into a cup. This sample is then grown in the laboratory to determine which organisms are present. The results are available in two to three days, except for tests for tuberculosis, which can take as long as two months. Occasionally, in diagnosing a chronic lung disorder, the sample of sputum is collected using a procedure called a bronchoscopy. In this procedure, the patient is given a local anesthetic, and a tube is passed into the airways to collect a sputum sample. A pulmonary function test is important in diagnosing chronic bronchitis and other variations of COPD. This test uses an instrument called a spirometer to measure the volume of air entering and leaving the lungs. The test is done in the doctor's office and is painless. It involves breathing into the spirometer mouthpiece either normally or forcefully. Volumes less than 80% of the normal values indicate an obstructive lung disease. To better determine what type of obstructive lung disease a patient has, the doctor may do a chest x ray, electrocardiogram (ECG), and blood tests. An electrocardiogram is an instrument that is used to measure the electrical activity of the heart and is useful in the diagnosis of heart conditions. Other tests may be used to measure how effectively oxygen and carbon dioxide are exchanged in the lungs. When no secondary infection is present, acute bronchitis is treated in the same way as the common cold. Home care includes drinking plenty of fluids, resting, not smoking, increasing moisture in the air with a cool mist humidifier, and taking acetaminophen (Datril, Tylenol, Panadol) for fever and pain. Aspirin should not be given to children because of its association with the serious illness, Reye's syndrome. Expectorant cough medicines, unlike cough suppressants, do not stop the cough. Instead they are used to thin the mucus in the lungs, making it easier to cough up. This type of cough medicine may be helpful to individuals suffering from bronchitis. People who are unsure about what type of medications are in over-the-counter cough syrups should ask their pharmacist for an explanation. If a secondary bacterial infection is present, the infection is treated with an antibiotic. Patients need to take the entire amount of antibiotic prescribed. Stopping the antibiotic early can lead to a return of the infection. Tetracycline or ampicillin are often used to treat adults. Other possibilities include trimethoprim/sulfamethoxazole (Bactrim or Septra) and the newer erythromycin-like drugs, such as azithromycin (Zithromax) and clarithromycin (Biaxin). Children under age eight are usually given amoxicillin (Amoxil, Pentamox, Sumox, Trimox), because tetracycline discolors permanent teeth that have not yet come in. The treatment of chronic bronchitis is complex and depends on the stage of chronic bronchitis and whether other health problems are present. Lifestyle changes, such as quitting smoking and avoiding secondhand smoke or polluted air, are an important first step. Controlled exercise performed on a regular basis is also important. Drug therapy begins with bronchodilators. These drugs relax the muscles of the bronchial tubes and allow increased air flow. They can be taken by mouth or inhaled using a nebulizer. A nebulizer is a device that delivers a regulated flow of medication into the airways. Common bronchodilators include albuterol (Ventolin, Proventil, Apo-Salvent) and metaproterenol (Alupent, Orciprenaline, Metaprel, Dey-Dose). Anti-inflammatory medications are added to reduce swelling of the airway tissue. Corticosteroids, such as prednisone, can be taken orally or intravenously. Other steroids are inhaled. Long-term steroid use can have serious side effects. Other drugs, such as ipratropium (Atrovent), are given to reduce the quantity of mucus produced. As the disease progresses, the patient may need supplemental oxygen. Complications of COPD are many and often require hospitalization in the latter stages of the disease. Alternative practitioners focus on prevention by eating a healthy diet that strengthens the immune system and practicing stress management. Bronchitis can become serious if it progresses to pneumonia, therefore, antibiotics may be required. In addition, however, there are a multitude of botanical and herbal medicines that can be formulated to treat bronchitis. Some examples include inhaling eucalyptus or other essential oils in warm steam. Herbalists recommend a tea made of mullein (Verbascum thapsus), coltsfoot (Tussilago farfara), and anise seed (Pimpinella anisum). Homeopathic medicine and traditional Chinese medicine may also be very useful for bronchitis, and hydrotherapy can contribute to cleaning the chest and stimulating immune response. When treated, acute bronchitis normally resolves in one to two weeks without complications, although a cough may continue for several more weeks. The progression of chronic bronchitis, on the other hand, may be slowed, and an initial improvement in symptoms may be achieved. Unfortunately, however, there is no cure for chronic bronchitis, and the disease can often lead to or coexist with emphysema. Taken together, all forms of COPD are a leading cause of death. The best way to prevent bronchitis is not to begin smoking or to stop smoking. Smokers are ten times more likely to die of COPD than non-smokers. Smokers who stop show improvement in lung function. Other preventative steps include avoiding chemical and environmental irritants, such as air pollution, and maintaining good overall health. Immunizations against certain types of pneumonia (as well as influenza) are an important preventative measure for anyone with lung or immune system diseases. National Jewish Center for Immunology and Respiratory Medicine. 1400 Jackson St., Denver, CO 80206. (800) 222-5864. 〈http://www.nationaljewish.org/main.html〉. inflammation of one or more bronchi. adj., adj bronchit´ic. Bronchitis may be either an acute or chronic disorder and frequently involves the trachea as well as the bronchi (tracheobronchitis). The acute stage of the disease often is an extension of an upper respiratory infection, which is usually viral in origin. Causes other than infectious agents are physical and chemical irritants that are inhaled in air polluted by dust, automobile exhaust, industrial fumes, and tobacco smoke. Acute Bronchitis. This condition is most often seen in small children and in the elderly or the debilitated. It is particularly serious in small children because their bronchi are smaller and more easily obstructed. The elderly and debilitated are prime targets for complications of bronchitis because they are more susceptible to secondary infections. Symptoms include the early symptoms of an upper respiratory infection or common cold, which progress to chest pain, fever, and a dry, irritating cough. Later the cough becomes more productive of mucopurulent to purulent sputum. There may be moderate fever with accompanying chills, muscle soreness, and headache. Clinical guidelines published by the American College of Physicians--American Society of Internal Medicine for treatment of acute bronchitis in otherwise healthy adults emphasize the importance of ruling out other serious illnesses such as pneumonia when evaluating a patient with an acute cough illness. Use of routine antibiotic treatment for patients with acute bronchitis is not recommended, since there is no research support for it. The practitioner is urged to give a realistic prediction of the duration of the cough, typically 10 to 14 days. A determination is important of which symptoms are most troublesome to the patient. Most patients seek treatment because of the cough. Randomized controlled studies support the use of bronchodilators in selected patients. Cough preparations containing dextromethorphan or codeine may reduce the severity and duration of the cough. Nursing and respiratory therapy interventions are logical, including control of the environment and vaporized treatments, based on the pathophysiology of acute bronchitis. Acute bronchitis and tracheobronchitis require a period of convalescence to avoid development of a chronic condition. Although the disease in its acute form occurs most often in the winter months, repeated bouts indicate a chronic bronchitis. Chronic Bronchitis. This condition is characterized by increased secretion from the bronchial mucosa and obstruction of the respiratory passages. It interferes with the flow of air to and from the lungs and causes shortness of breath, persistent coughing with expectoration, and recurrent infection. There is no cure for the disorder and its management requires long-range rehabilitation involving patient education and cooperation in carrying out the prescribed regimen. Inflammation of the mucous membrane of the bronchi. acute bronchitis a short, severe attack of bronchitis, with fever and a productive cough. chronic bronchitis a type of chronic obstructive pulmonary disease with bronchial irritation, increased secretions and a productive cough lasting at least three months, two years in a row. fibrinous bronchitis bronchitis with violent cough, paroxysmal dyspnea, and expectoration of bronchial casts containing Charcot-Leyden crystals. bronchitis obli´terans that in which the smaller bronchi become filled with nodules composed of fibrinous exudate. Chronic or acute inflammation of the mucous membrane of the bronchial tubes. 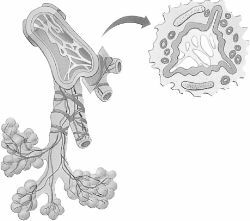 acute or chronic inflammation of the mucous membranes of the tracheobronchial tree. Caused by the spread of upper respiratory viral or sometimes bacterial infections to the bronchi, it is often observed with or after childhood infections, such as measles, whooping cough, diphtheria, and typhoid fever. See also chronic bronchitis, chronic obstructive pulmonary disease, respiratory syncytial virus. observations Acute bronchitis is frequently preceded by an upper respiratory infection. The most common presenting sign is a dry, hacking cough that increasingly produces viscous mucus. Other symptoms include low-grade fever, substernal pain, and fatigue. Rhonchi and occasional wheezing may be heard when auscultating lungs. Diagnosis is usually made from the type of cough and sputum. Chest x-rays are taken to rule out other disorders. Arterial blood gases are monitored when the underlying chronic disease is present, and sputum is cultured for evidence of superimposed infection. Pneumonia is the most common complication. Acute respiratory failure occurs in some individuals with underlying pulmonary disease. Chronic bronchitis may be asymptomatic for years. A productive cough with copious mucopurulent sputum, peripheral cyanosis, and variable dyspnea are typical presenting signs. The cough becomes increasingly progressive and the sputum production more copious. Wheezing, tachypnea, and tachycardia may also be present. Several attacks per year are common. Chest x-rays reveal cardiac enlargement, congested lung fields, and thickened bronchial markings. Pulmonary function studies show increased residual volume and decreases in forced vital capacity and forced expiratory volume. PaO2 is decreased and PaCO2 increased on arterial blood gas results. Sputum cultures show presence of multiple microorganisms and neutrophils. Cor pulmonale, pulmonary hypertension, right ventricular hypertrophy, and respiratory failure are common complications seen in chronic bronchitis. interventions Treatment for acute episodes include medications, such as inhaled bronchodilators for wheezing, expectorants for cough, and antipyretics for fever. Antiinfective drugs are used only with concomitant chronic obstructive pulmonary disease (COPD) or a superimposed infection. Adequate hydration and a vaporizer help liquefy secretions. Treatment for chronic bronchitis includes antiinfective drugs for infection, bronchodilators to reduce dyspnea, and corticosteroids to reduce inflammation. Chest physiotherapy is used to loosen secretions. A vaporizer and hydration help liquefy secretions. Oxygenation is used for hypoxia. Health promotion in individuals with chronic disease include a consistent exercise program to improve ventilatory and cardiac function; smoking cessation programs and use of flu and pneumonia vaccines for prophylaxis. nursing considerations The focus of nursing care during acute episodes is supportive and includes rest, increased fluids, and steam vaporizer. Education plays a large role for those suffering from chronic bronchitis and includes information on the disease process; instruction on medication administration (schedule and use of spacer), home use of oxygen, chest physiotherapy program, effective coughing, exercise program, nutrition plan to decrease weight if indicated, smoking cessation if indicated, and proper use of respirators in workplace if exposed to respiratory irritants. Importance of long-term and consistent follow-up should be stressed. Chest medicine Inflammation, often with edema and erythema, of one or more bronchi, usually 2º to infection Clinical Coughing, pain, SOB. See Chronic bronchitis, Plastic bronchitis. Acute (e.g., caused by recent infection) or chronic (e.g., long-term infection, smoking, cystic fibrosis) inflammation of the mucous membrane of the bronchial tubes. ACUTE or CHRONIC inflammation of the lining of a BRONCHUS. Acute bronchitis commonly follows a cold or influenza, usually in winter. There is a cough with increasing production of sputum, fever, breathlessness, wheezing and sometimes pain in the chest. Chronic bronchitis may be caused by breathing a polluted atmosphere or by smoking. There is constant sputum production and acute infective flare-ups occur. Repeated attacks of winter bronchitis are an early feature of chronic bronchitis. an inflammation of the bronchial tubes, resulting in a cough and the production of sputum. In chronic bronchitis the swelling of the bronchial mucous membranes causes narrowing and obstruction of the airflow, especially when breathing out. Common causes are smoking, atmospheric pollution and infection with bacteria such as Streptococcus pneumoniae. n inflammation of the tracheobronchial tube. May be triggered by viral infections in the upper respiratory system spreading to the bronchi. Symptoms include fever, productive cough, and chest pain. n an acute or chronic inflammation of the mucous membranes of the tracheobronchial tree. inflammation of one or more bronchi. Signs of acute bronchitis include fever and an irritating cough. Bronchitis may be either an acute or chronic disorder and frequently involves the trachea as well as the bronchi (tracheobronchitis). The acute stage of the disease often is an extension of an upper respiratory infection which is usually viral in origin. Causes other than infectious agents are physical and chemical irritants that are inhaled in air polluted by dust, industrial fumes and powdered feeds. The important clinical signs indicative of bronchitis are cough and the ease of stimulating a cough by compression of the trachea, and bronchial tones on auscultation of the base of the lungs. At necropsy the case may be classified as catarrhal, eosinophilic, fibronecrotic, purulent or ulcerative. caused by coronavirus. There are many serotypes. Causes gasping and rales, heavy mortality and rapid spread in young birds up to 4 weeks of age. Called also gasping disease. Q. BRONCHITIS what are the causes? A. Bronchitis is an inflammation of part of the large airways. Acute bronchitis is usually an infectious disease, while chronic bronchitis is usually caused by smoking. Q. Do I have Bronchitis? I had a cold and since then I have a severe cough which I can't seem to get rid of. Is this bronchitis? Does it need to be treated or will it go away by itself? A. Bronchitis usually comes after a cold. Cough is a common symptom of bronchitis. The cough may be dry or may produce phlegm. Significant phlegm production suggests that the lower respiratory tract and the lung itself may be infected, and you may have pneumonia. The cough may last for more than two weeks. If you also have trouble breething and have a fever then go see your Doctor. The lung manifestations of AAT deficiency include emphysema, chronic bronchitis, chronic obstructive pulmonary disease (COPD), bronchiectasis, and asthma. 6)(7)(8) Results of cross-sectional(9)(10)(11)(12) and prospective(13)(14) epidemiologic studies have found that preceding respiratory illnesses, including bronchitis, chronic bronchitis, and pneumonia, are associated with subsequent asthma in both children(9)(12)(13)(14) and adults. Infectious asthma: a reemerging clinical entity? Bronchiectasis patients usually suffer from recurrent, severe episodes of bronchitis, chronic cough and sputum production. The study focused on the cost of medical care given to individuals who have asthma, chronic bronchitis, chronic airway obstruction, and other major respiratory diseases, compared with costs for people who do not have serious lung problems. COPD is a slowly progressive disease of the airways that is characterized by a gradual loss of lung function and includes chronic bronchitis, chronic obstructive bronchitis and emphysema, or combinations of these conditions. 5] exposure (asthma, bronchitis, chronic obstructive pulmonary disease, pneumonia, and upper respiratory tract infection), and genitourinary conditions, a type of condition chosen as a control because the authors assumed they would not be associated with exposure to vehicle emissions.